Growing up listening to symphonic works of Beethoven, Liszt, and Wagner and being involved with orchestra throughout my musical career, I have developed a deep love for the symphony orchestra. During my time in St. Petersburg, I have mainly viewed musical concerts at the Mariinsky Theaters. Although I have enjoyed all the performances that I have attended, most of their program revolves around the ballet, opera, and the chorus. 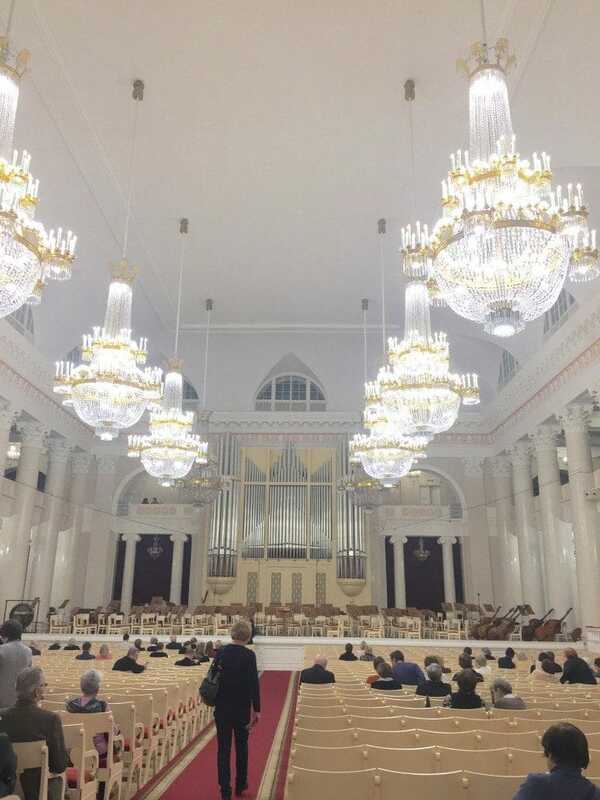 I have seen several wonderful symphonic concerts at the Mariinsky Theaters, but I was thrilled to discover the concerts of the St. Petersburg Academic Philharmonia. This is a musical organization that focuses on the works performed by symphony orchestra and chamber groups. The St. Petersburg Philharmonia is the oldest Philharmonia in Russia. This organization is the product of the St. Petersburg Philharmonic Society founded in 1802. Its main concert venues are the Small Hall and the Grand Hall. The Small Hall is located on Nevsky Prospect near the metro station next to Griboedova Kanala. The first Russian Philharmonic Society gave its concert in this hall. The world premieres of Haydn’s The Creation (1802) and Beethoven’s Missa Solemnis (1824) occurred in this hall. In 1949, the Small Hall became apart of the Leningrad Philharmonia and was named after Mikhail Glinka. I attended one concert at the Small Hall where I saw an orchestra made up of traditional Russian musical instruments performing overtures and arias from Italian opera. The Grand Hall is located in Arts Square (Искусств Площадь) on Mikhailovskaya Street. The Hall was constructed in 1839 for the St. Petersburg Assembly of the Nobility and beginning in the 1940 became the center of musical life of the city. Liszt, Berlioz, Wagner and other famous European musicians performed here in the 19th and 20th centuries. Many Russian composers have premiered their works here including Rimsky-Korsakov, Borodin, Mussorgsky, Tchaikovsky, Glazunov, Prokofiev, and Shostakovich. In 1921, the Philharmonia was given the hall of the Assembly of the Nobility. This is the hall where I attended the majority of the Philharmonia’s symphonic concerts. The St. Petersburg Academic Philharmonia consists of two symphonic orchestras: the St. Petersburg Philharmonic Orchestra and the St. Petersburg Symphony Orchestra. The St. Petersburg Philharmonic Orchestra descended from the Court Orchestra. The Imperial Music Choir transformed into the Court Orchestra in the beginning of the 20th century. In 1917, the Court Orchestra was renamed the State Philharmonic Orchestra and was directed by Sergei Koussevitzky (1874-1951), who would eventually become the music director of the Boston Symphony Orchestra from 1924-1949. Evgeny Mravinsky (1903-1988) was the director of the Leningrad Philharmonic Orchestra from 1938-1988 and under his direction, the orchestra gained reputation as one of the best symphonic orchestras in the world. Since 1988, the orchestra has been under the direction of Yuri Temirkanov. The St. Petersburg Symphony Orchestra was descended from the Leningrad Radio Symphony Orchestra, which was organized by the Leningrad Radio in 1931. The Leningrad Radio Symphony Orchestra was the only orchestra to remain in Leningrad during the German siege of the city in World War II. 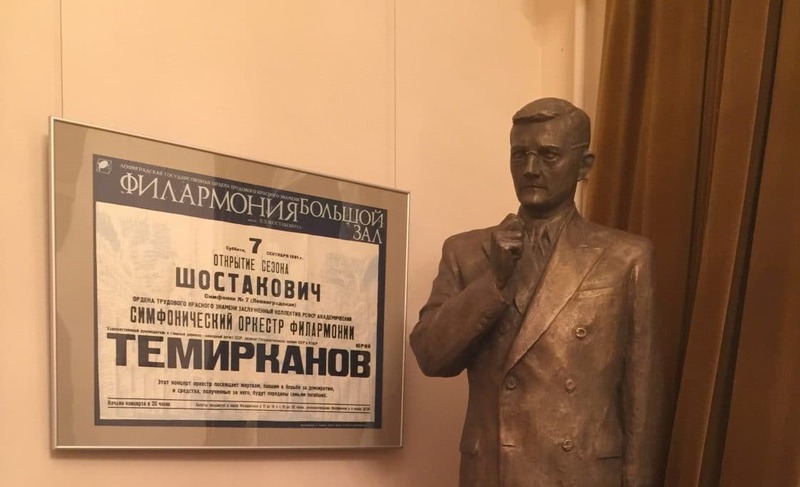 In August 1942, the orchestra gave the Leningrad premiere of Dmitri Shostakovich’s Symphony No. 7 in C major, known as the Leningrad Symphony. In 1953, the orchestra became apart of the Leningrad Philharmonia. Since 1977, the Symphony Orchestra has been under the direction of Alexander Dmitriev.